The procedure given below should be followed by those who wish to practice this Vashikaran Tantra to cast a Vashikaran Spell on any desired man or woman. 1] This VashikaranTantra should be practiced on an Amavasya. 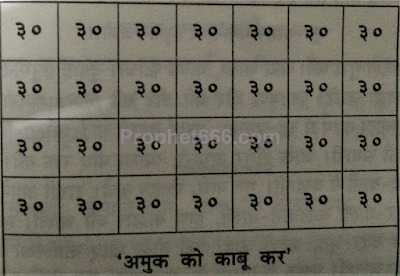 2] The practitioner has to go to Samshan Bhoomi and then write the Yantra and the Mantra [ shown below in this post] on a raw brick, which means a pain brick with no designs on it using a piece of coal from the Samshan Bhoomi. 3] Aftrr writing the Yantra and Mantra on the brick, the practitioner has to bury the brick in the Shamshan Bhoomi or under any Kabra. 4] Then, the practitioner has to give a Bali of Lemon and offer Liquor as Naivedya and while offering the Liquor say that “amuk stri ya purush ko mere vash me karo “or as you want to say it in your own language. 2] 7 boxes should be there in 1st line and in this way create 4 lines with 7 boxes below each line. 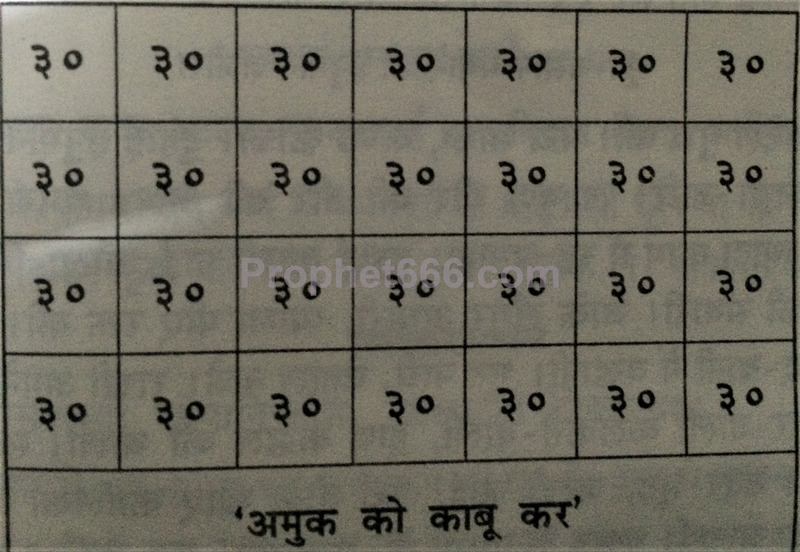 3] In every box write the number ३० as show in the image of the Yantra given below. Note- All kinds of Vashikaran, Akarshan, Mohini, Sammohan Yantras, Mantras and Remedies for casting Attraction Spells on desired persons can be seen in the various sections of this site. can we break the brick from one side and make it plain and do this prayog as no brick is available in plain ,bricks being manufactured in bhatti always have the owner name engraved on one side. Could you write the mantra in hindi as you cannot write mantra in english on the brick.